There are many ways to determine the best place to buy a given product in a specific market. Google + Local reviews are often one way that consumers are able to decipher exactly who will give them the best and highest level of customer service during their purchase. 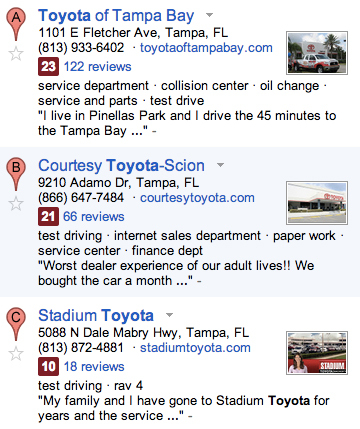 Toyota of Tampa Bay currently holds the #1 position in Tampa Bay as of April 2013 with Google +. "Fast, Friendly, Fair & Fun!"